RUMOR MILL - WILL CASTELLANA DRIVE A SUPERCHARGED CAR IN 2017? Read more about RUMOR MILL - WILL CASTELLANA DRIVE A SUPERCHARGED CAR IN 2017? RUMOR MILL - PROCK ROCKET ON THE MOVE? A source close to the situation has told CompetitionPlus.com that tuner Jimmy Prock has left Don Schumacher Racing and and we are told his destination is a team he's very familiar with. We'll have more on this story as it becomes available. Read more about RUMOR MILL - PROCK ROCKET ON THE MOVE? RUMOR MILL - HOWARD'S TO PURCHASE MIDWEST RACING SUPPLY'S BILLET CRANK DIVISION? Floating around the industrial rumor mill, a source has told us Howard's Racing Components are in negations to purchase Midwest Racing Industry's billet crankshaft division. They will build big block Chevy crankshafts, called the Billet Reaper, for everything from bracket racing to truck pulling with cost-effecient pricing under $1400. Read more about RUMOR MILL - HOWARD'S TO PURCHASE MIDWEST RACING SUPPLY'S BILLET CRANK DIVISION? 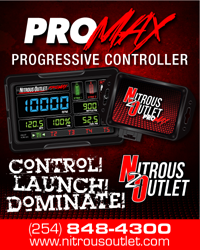 RUMOR MILL - THE SO-CALLED CHANGES TO PRO STOCK IN 2017? Read more about RUMOR MILL - THE SO-CALLED CHANGES TO PRO STOCK IN 2017? RUMOR MILL - NO NATIONAL EVENTS? REALLY? According to a few prominent members in the know, we are told that for the first time since its 1971 debut, the IHRA will not feature a national event schedule. From what we are told, the divisional events are in question as well. If there's no national or divisional events, what is there? Read more about RUMOR MILL - NO NATIONAL EVENTS? REALLY? If you enjoy buying your sunglasses and apparel at Oakley's Rolling O store on the NHRA Manufacturer's Midway, you had better stock up this weekend in Las Vegas and in two weeks at the NHRA Finals in Pomona, Ca., because our sources tell us the lifestyle company will not return for 2017. This is one vendor we are going to hate see leave the series. RUMOR MILL - A THIRD-GEN DRAG RACER HEADED TO PRO STOCK? Word is floating through the Texas Motorplex pits that there's a strong liklihood a third generation NHRA drag racer could make his Pro Stock debut in 2017. If this all comes to fruition, it could be the youthful shot in the arm the class needs moving forward. Read more about RUMOR MILL - A THIRD-GEN DRAG RACER HEADED TO PRO STOCK? RUMOR MILL - THIRD KALITTA TOP FUEL DRAGSTER COMING? A press conference is scheduled with Kalitta Racing on Saturday during the NHRA Fallnationals at the Texas Motorplex. Could this be the announcement of a third Top Fuel car for 2017? This is definitely the talk around the pits. Read more about RUMOR MILL - THIRD KALITTA TOP FUEL DRAGSTER COMING?